At long last, the Pathfinder Society has reassembled the Numerian device known as the Sky Key. Initial tests suggest it is capable of projecting a location's past into the present, allowing Society agents to peruse books from destroyed libraries and speak with echoes of long-dead heroes. Now that it has perfected the Sky Key's controls, the Pathfinder Society is prepared to extract a slice of Absalom's history and bring it into the present; however, there's no telling what might be waiting inside—or who in the present might wish to wield the same power. 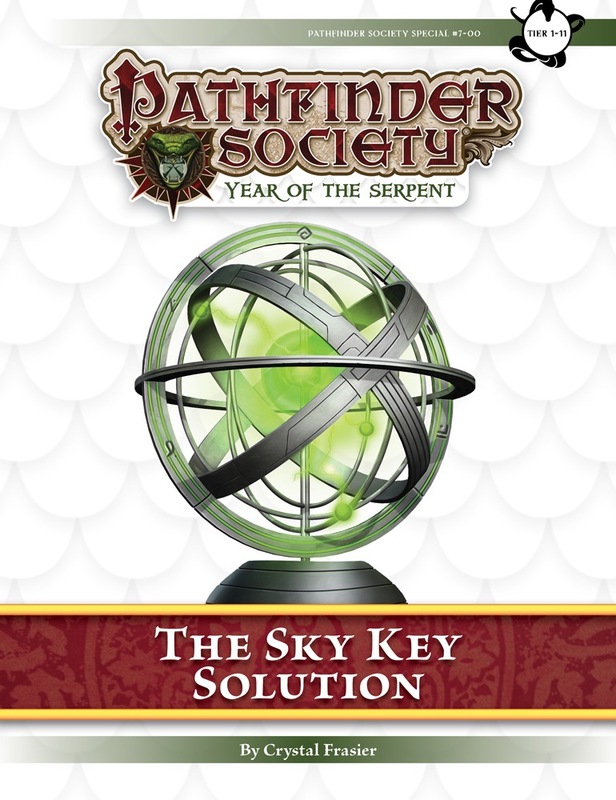 Note: The Sky Key Solution is designed for play in the Pathfinder Society Roleplaying Guild. It may be run anywhere by anyone, as long as there are 5 tables playing the scenario simultaneously and are in contact with each other. To inquire about access to this scenario, refer to the Organized Play Convention Support Policy. Too ambitious, too much, but still fun. A year was spend gathering Sky Key Components and now was the time to put them to good use. Like three others below (Quentin, Damanta and Ascalaphus) I got ready to give it my best during a 7-hour-timeslot. Originally I planned to play this with my alchemist, who gathered two or three pieces, but due to circumstances and opportunities I ended up using a specific boon to "Kobold or go home". Imagine my surprise as we got to free humans from the reptilian overlords in the first half of the special. Now due to the whole Kobold situation, I wasn't even the only one at the table, the first part of the special was a blast. We were the true descendants of dragons and our unique alignment added a lot of flavor to the mix. It also allowed our party to pursue some more intimidating approaches at times, which actually worked in our favor. The two of us had an average intimidate of 28, while the rest of our tier 3-4 group had an average diplomacy of 30 with everyone assisting. We made a mess of things, but it worked and it was hilarious. I can't thank my GM enough for letting us be silly like that. The second part was a bit different and more of a sandbox. It allows for creativity and is put well together. However, since it's a special, it's in my honest opinion a huge mistake. Specials are not known for being able to be creative as there are huge time-constraints. Even though we had a 7 hour slot, there was just not enough time. We like to actually talk to NPC's instead of rolling dice and moving on instantly. The idea is nice, but the special suffers from the typical special flaws. It's too ambitious and tries to do too many things in too little time. I could tell by the amount of paperwork and time GMs needed to find the right page that is was even more complex on their side. I had the feeling that it simply too much for them to handle, even though they had prepared well. Mind you, they all still did a great job, but I could sense the frustration. In the end the story was nice, but would have been better had it been two separate specials. The combats were a bit easy as well and not challenging. While that is a nice change of pace compared to some other specials, this was just underwhelming. The fact that every party-member could contribute with literally every skill is a major improvement though. Everyone was useful the entire time and I also applaud the fact that there were more solutions for certain problems. The fact that you don't necessarily have to fight in order to be successful is something I appreciate seeing in a special. If you were to combine this with certain mechanics of Legacy of the Stonelords and you have a recipe for a five-star special in the future. For now, this one only gets three. After spending a year gathering Sky Key components, this should be the big payoff. We're turning it on and bringing a slice of the past into our grasp. There's so much riding on this. Does it deliver? I'm not really sure. First, let's talk about the choice of "slices". I kinda dig them; the first one is a bit of a rematch of Stonelords exploration, which was great. Although I think fewer players will have their imagination fired by Serpentfolk than dwarves did (we have Moria to thank for that), they make for a fresh breath of enemies we haven't faced a lot. What could have been improved is the research agenda; I think a "shopping list" of things we want to investigate would have made this more of an exploration bit and less of a "kill them and then notice their pottery" bit. The Inevitable Surprise Twist was IMO well chosen, does a nice job of putting on the pressure. It ties in to Golarion lore, although you may have to be a bit of a lorehound as a player to know that. Which means for a lot of people it'll fall a bit flat and these'll just be random enemies. I didn't like the execution of the second part quite so much. The justification for the sandboxy start of it was a bit too much "I don't know any actual science but this sounds like believable technobabble to me" blah blah. We got to interact with and try to persuade a lot of caricaturesque NPCs to cooperate. This is where the time pressure starts to kick in; OOC you know you can't really afford the time to RP this out, but it doesn't make any sense for your party not to (LG, LG, LG, NG, CG, with average diplomacy score >= 15). At the final fight we got a choice: face the waves or face the boss. We concluded that tactically, facing the waves made more sense, especially given that many tables had gone for the boss. But who really wants to play second fiddle? I remember facing the waves at lowest tier during Siege of the Diamond City and being bored out of my skull; don't want that again. The "steps of the throne room" fight in Stonelords was a much more elegant way of doing that, it gave the impression of everyone being in it together, while still having a nice way to separate enemies by tier. Let's evaluate the combats. Mostly, they were fine. Many of them were a bit easy, with enemies that had trouble hitting so-so AC (24 on 10-11 tier). Choice of enemies was varied while keeping to a theme, which is good. Enemies had some tricks up their sleeves which was also good. On the whole we didn't really need to pull out all the stops; a bit more intensity would've been fine by me. The big problem was time. We got cut off in the middle of the big fight of part one because we got yanked into part two. It made sense story-wise, but it's a real turn-off. I much prefer the "finish this encounter faster" approach over "the encounter just ends inconclusively as you proceed to a new act". And in part two we almost ran out of time in the final fight as well. Now the time pressure mechanics made perfect sense in the context of the scenario, but we were all exasperated at how little time was budgetted compared to the number of encounters. I really felt that we were doing ourselves a disservice by actually talking to NPCs instead of just rolling skills and moving on as fast as possible. Because the time pressure was so intense. Our GM was fairly well-prepared, but also had to spend quite some time paging back and forth. Statblocks spread acrosss multiple pages for all the things you need in a single encounter, complex tracking mechanisms. This could have been ameliorated with layout that focuses on practicality for the GM, rather than aesthetics or minimizing page count. I think it would save a lot of time if encounters were concentrated in 2-page spreads, where you have all the statblocks needed to run an encounter on a tier, on two pages facing each other. That saves you time looking in appendices, paging back and forth because some statblock is re-used from earlier in the same scenario and so forth. Tries to do too much. This is a very busy special. GMs have to track a lot of things, and have to track three different point systems at one point. That's quite a handful when you're also on the clock to finish on time and there's so much to do in this scenario. Special writers the last few years seem to think that more equals better, but I think there's simply too much to do in this scenario. Legacy of the Stonelords is my go-to example where complexity met with simplicity perfectly, as well as story and challenge. That special had (to me, where I GMed the 1-2 table) a clean and simple story, and each area operated mostly under the same rules. The GM understood those rules and could focus on running the encounters. This scenario however, changes the rules between parts, and sometimes even during a part, and vital information (such as how many successes are needed to progress) is hidden away in regular text. There's one instance where it is clear and bolded out, but there are also many more instances where it isn't. Storywise, I love the concept, but it too feels cluttered. There's two parts to this, and each part could've been its own special, but now it tries for a weird reveal halfway through that creates a whiplash for the players just as they're starting to get a grasp on things. I love Crystal Frasier's work as she's clearly very imaginative, but her work clearly shows some problems, which is a shame. On the combat side of things, it's fine. There are no real standouts like in Siege of Serpents (which had an amazing diversity of creatures), but combats felt sort of dull to me. Maybe it's the tier I was GMing in, maybe it's the fact that I had a well-rounded table of 6, but my players didn't feel challenged that much, except for one or two encounters, and those weren't even major encounters. The enemies' damage output wasn't really threatening enough, and most of their to-hit was only so-so, comparable to first-level PCs, except for those one or two threatening encounters, which hit like a truck. Overall though, fights mostly consisted of small groups (2-3 enemies) of enemies with between 10 and 30 HP (or one big one with double that), which all fell within two rounds without much effort, or one round with some effort, which made combats more like a hassle than an actual challenge. Players just stomped over them due to sheer numbers and action economy, rather than through power or tactical play. This might've been just my tier, but I feel that combats could've been improved somewhat. I think slapping the Advanced template on most of the creatures would've been a decent challenge, instead of a speed bump. There's a big time limit on this adventure, and there's no way people can do and explore at their own pace. Locations also feel pretty bare-bones as a result, as my players kept wanting to explore further, but there wasn't any more to find or do. I would've preferred some more detail here. There's a weird sandboxy bit in the middle that could've been handled more elegantly, I feel. Maybe it's just me, as I don't handle free-form too well, but when I explained how it's now a mad scramble to wherever you want to go, they just asked me where they should go, instead of seizing the initiative themselves. Maybe it's just my players, maybe it's just me, but after pushing my players so hard all this time, getting free rein put them in shock. In general though, I feel like the social encounters could've been handled better. I must admit I'm not the greatest in social roleplay, but these encounters felt a little too open-ended, with not much for me to go on. I wouldn't call it hand-holding, but I would've liked some more guidance in this respect. Perhaps my biggest gripe is how the scenario encourages GMs not to run the final (and coolest) encounter for low-level tables, and instead just fight waves of regular enemies, like Legacy of the Stonelords. Unlike Legacy, though, you don't miss out on plot if you decide to stay behind, which is a shame. My players were torn between fighting more waves that weren't really challenging for them, or start an encounter they've been warned about is much more challenging than they've fought so far. But, there's also a good part, not just an angry rant: I like how skill checks were incorporated into the scenario, rather than it being a stomp-fest. No matter what you specialised in, if you had some skill points to spare (sorry, Paladins, Clerics, Fighters, and Warpriests), you could've contributed in some way to this adventure. They really rewarded skill monkeys and specialists alike, although I felt like the skill DCs were maybe a bit too easy, as most of them could've been made by taking 10 (I didn't tell them that, though, I let them roll), so at one point those challenges felt trivial as well. I also like the tie-ins to last season. While not everyone is an equally active player, I like how having played some key scenarios made you get an advantage during this special, which made it feel more awesome that you contributed. In the end, I like this special for its ambitiousness, but I think it overreached somewhat. In this case, less is definitely more. There's a word and page count you have to work with, but I would've preferred less subgames/subsystems and more attention to a few encounters, rather than lots of mediocre encounters. Played it today in a 7 hour slot (10-18 with half hour lunch break and muster taking about half an hour). Tier 10-11, with level 11 cleric, level 11 paladin, level 10 barbarian, level 10 bloodrager, level 9 bard. Only the barbarian I don't recall if he was diplomatic, but the other 4 would try to talk if it would be possible and solve stuff not by violence, which kinda didn't really work out often. Combat: 1 out of 5 stars. Nothing seemed to stand out. While mildly dangerous due to stupid tactical decisions (oh lets tumble past those two strong looking fellows, so they can flank me next round so I can whack the caster), due to a cleric who had dedicated herself to healing nobody was ever in serious danger, without that cleric I would personally never have been soo reckless and used a lot more tactical combat. Story: 2 out of 5 stars. Two stories folded in one. Too much crammed into it, resulting in something that just didn't come out as it could have. Should have gone with a more worked out version of either the first part, or the second part, with for me personally the second part being more interesting. A short period spend on the first part, say maybe 2 encounters total, and then the rest of the time in the second part would have improved this by a lot. There were a few more options available in the second part that did not involve only combat. The ending was also a bit of a letdown. It felt like you can do either this or that, but if you choose that, you also have to do a bit of this because of reasons. If you choose this you don't get that. Social roleplay: 2 out of 5 stars. First part was almost only combat for us, with only 1 encounter we could talk with/to. The second part had a lot more potential, but it felt all a bit rushed because of cramming too many options into it but not considering that social roleplay can take a lot longer than combat, because people try to roleplay their rolls, which I have noticed takes a lot longer with social skillchecks compared to combat. Aid token: There was 1, but I have not seen it being used, even with only having a grand total of 6 tables. Also no idea what it could have been used of this time. The chronicle sheet is the most redeeming part of this adventure in my eyes, with a lot of interesting options. The most enjoyable bit from this special for me was simply the interaction between the partymembers, not between the party and the adventure. Also due to me playing in a certain adventurepath, I had a lot more OC insight into the first bit, which I found quite a nice touch. Put it in the Dark Archive and RUN! So is this also a multi-table? Yes. They are putting out 2 multi-table events for this year. One debuts at PaizoCon and one at GenCon (with the PaizoCon one being rerun at there). Both scenarios are levels 1-11. I am very excited for this one! Can someone confirm for me that this will debut at this year's GenCon and then will be played at NEXT year's PaizoCon? I'm going to PaizoCon THIS year (in May). Hello Aroden? Yes I'll hold but that may not be the best... Dammit. Man, this sounds so cool. I wish I could make it to one of the Cons that had the tables to run this! I just downloaded this and noted a couple of odd things. Is is just me, but the Sign in and Chronicle sheets for this are for #7-02 Six Seconds to Midnight. Also the map on page 9 seems to be missing. Is there an update due on these? If its a PDF, then why is it "unavailable"? Especially since it is so new and the next 3 are available. Serpentfolk rampage in the past ... interesting. Overall, a really fun game to run, and it seemed like the people at my table enjoyed playing it. The history of the "Ages" involved are fleshed out just enough. There are plenty of options here, for a hack and slash party or a diplomacy-based party. Especially a diplomacy based party, truth be told. Only real problem I can find with multi-table games like this is the issue of pacing, which I imagine differ from table to table, and GM to GM. If the temple interior is open, bypass the plaza entirely, or you might not have enough time to enjoy the possibilities with an ancient hero. This is a timed game, so certain role-playing luxuries (scenery chewing) must be foregone. If the vault opens in the final chapter, forget the rest of the anchors and get right to Arodeth. Overall, great game, and lot of potential for future games like it involving the Sky Key's chronal powers. I enjoyed it even more than Siege of Serpents. I'm trying to understand the numbering scheme of these special scenarios, but I'm confused. #5-99 was listed as "kicking off season 6", and it seems #6-99 does the same for season 7. while #6-00 looks more like it belong to season 5, and #7-00 to season 6 ("sky key"). Am I the only one who can't make sense of that? what gives? You should've got a message when you originally got 7-00 in your downloads that the version you were getting was specifically not a cleaned up version because Paizo wanted us to have the scenario early so we could better prepare it for GenCon. It wasn't supposed to be perfect. This was intentional. @GamesManipulator: The multi-table specials from the past year are only available to conventions. Once one year has passed, they will become available for purchase and there will be a new special that is con-exclusive. Sort of the same question, does this follow the events of Siege of Serpents, or happen before? Can anyone with Paizo comment on when this scenario will be available for purchase?